The BSc Nursing Course is a 4 year degree course that is affiliated to Chaudhary Charan Singh University, Meerut and is approved by the Indian Nursing Council. There is no entrance test for taking admission but the eligibility criterion is the marks scored by the students in their senior secondary examination from science stream. Zero Fees with Full Scholarship for Eligible Students. B.Sc. 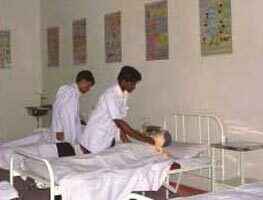 Nursing (4 years) – Approved by Indian Nursing Council, Delhi, Affiliated to Chaudhary Charan Singh University, Meerut ( Formerly Meerut University ). Eligibility : min 45% with pass in +2 or its equivalents with Science subject (Physics, Biology &Chemistry and English). Annual intake : 40 students. (No Entrance Test, Second/ Third / Final Year Students May Also Apply). This fee is required to be deposited at the institute at the time of getting the admission. The required fees should be deposited in cash or by demand draft in favour of Amogha Institute of Professional and Technical Education, payable at Ghaziabad. For any further clarifications please feel free to contact us.